If my husband really knew what I do during the day, he'd go to his grave. 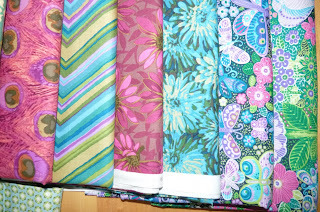 With great dreams of making up several quilt tops in the next 4-8 weeks, I decided I needed to acquire a little fabric. In all reality, I probably didn't "need" to, but I discovered a fantastic online shop, and couldn't resist. Four days later, I had eighteen new yards of yumminess. 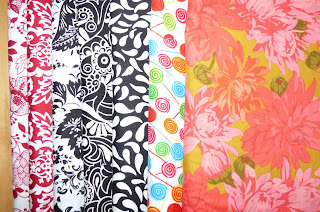 Best of all, none of it was over $3.50/yard! If you have never visited Whittles, it's worth your time. 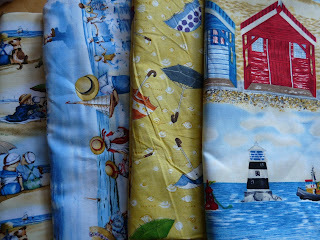 The Beach fabrics I bought were not from there, and were not quite as good of a deal, but I was so tickled to find the Friendship by the Sea prints that $7 per yard seemed awesome. The Elizabeth Studios (left) Friendship By the Sea, which are so sweet, will be the essence of a couple picnic/beach blankets I plan to make. 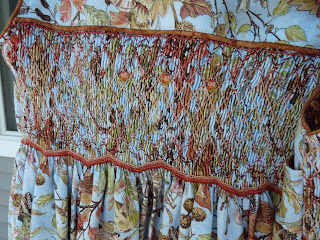 The panel below, which I have 2 yards of is also from this line. I found the beachy huts print at Joann's. It's a very nice quality print snagged up at their 40% discount, and coordinates with the other beachy fabrics really well. Some months ago I won a runner up giveaway from Anna. In May I think, a package arrived, postmarked from Singapore. I was intrigued since I was not expecting anything (the giveaway had been 4-6 months prior). She sent me a bunch of Noah's Ark prints from Debbie Mumm. 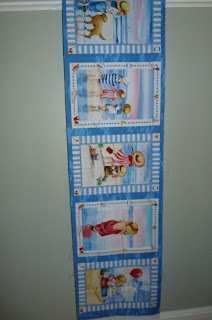 There were 3-4 fat quarters and 2 lovely panels. Finally (in my quest to move out some novelties, and to make my Project Linus goal of 52 quilts), I pulled out these fabrics and made this. Now, I am not religious whatsoever, and I don't think that these donated quilts ought to have any religious affiliation either. But I also think that many children can relate to the story of Noah's Ark and appreciate this. Making this quilt also gave me an excuse to try out some great new thread. Lisa sent me a 1200yd spool of thread last month, and I wasn't sure when I'd use it since I didn't have a quilt in blue or gray in the que to be quilted. It came from here. 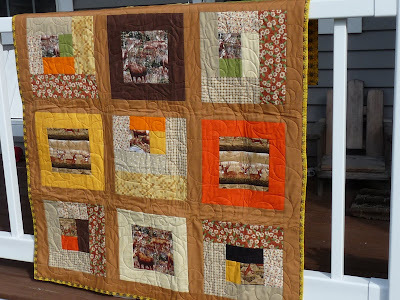 After I quilted the Noah's Ark quilt, and completely loved the thread I searched out where to find more of it. Much to me complete surprise, these spools of thread are only $2 each!. I have been using King Tut (40 wt) and often Coats&Clark 50wt from Joann's, mostly because the latter is easy for me to get whenever I need it. I love the way the King Tut looks, but I sometimes have tension issues on my machine with the 40wt threads, so it becomes a bit of a Love-Hate relationship. Now the Connecting Threads thread is a 40wt, and the variagated is not as nice as the King Tut's in that the colors change every few inches, but I think I could really like quilting with the solid colors, and the price is perfect! 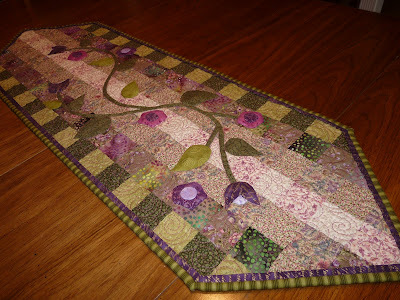 I should call this the Mis-Adventures in Margaret's Long Arm Quilting. Last weekend I took 2 flimsies to try quilting on the HQ16, which I may end up purchasing. Before you read further, know that these are LOUD, and not the most lovely of flimsies. THey are total scrappies, with an objective of using up that gosh ugly yellow (actually a Henry Glass) fabric. It is on the back of both quilts too. These will be donation quilts, but they are far from my favorite concoctions. 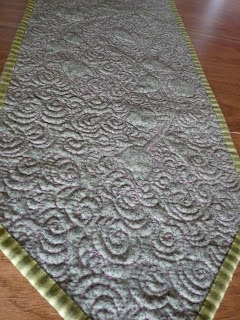 On this one (actually the 2nd one quilted), I used a clam-shell groovy board. It was definitely harder to get into each point neatly than I thought. There's a closeup next. You can see at some of the points where I did not get them sharp. It actually took longer than the next quilt, which is free quilted. All in all, not too bad though. I guess. And here was the 1st quilt done on the LA. More icky brown and yellow, and a novelty deer print that I am happy to see go. 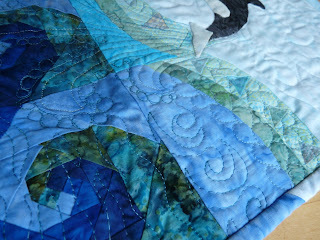 I free quilted this one, and tried to quilt it similarly to the Noah's Ark quilt so that I could compare them. It turned out pretty well, and was not that hard either. The biggest difference in these 2 quilts and ones done on my machine is how much more taught the backs are. 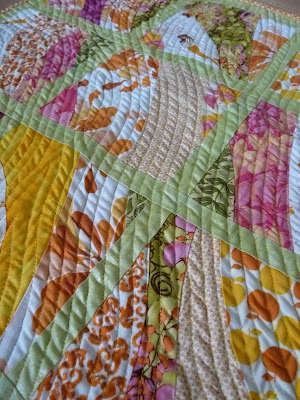 The quilt frame-rack does a very nice job of keeping the backing smooth. In time I know I will get my curves smoother, but it's not bad for the first try. Now, to wash these three quilts and bag them up for their new owners. And lastly, since I don't want to decrease my chances of winning this too much, I have posted about it last. Kellie (aka DontLookNow) is giving this away! 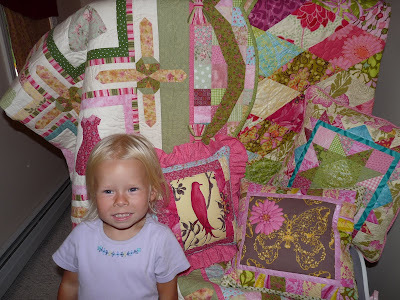 It is amazing like all of her quilts and pillows. Have a look if you want it in your home. Me...I think it'd look smashing in my daughter's room (or mine!!). What is a good size? This flimsy is 53" x 66" and seems big for a lap quilt, but anything smaller seems like it may be too small to adequately wrap up in on a chilly night. Picnic or beach quilt? Does anybody use these? I have been to the beach 6-8 times this summer and my 40"x70" 40 year old quilt is just too small once there are 1-2 kids on it. It hasn't got adequate weight to keep it down in the slightest amount of breeze either. 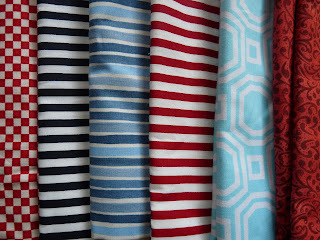 I have some great "beachy" prints and want to make some quilts with them (plus all of these type prints are going on good sales this time of year too). How does a quilter make any money on making quilts versus just quilting them (not like I really want to make much money!! 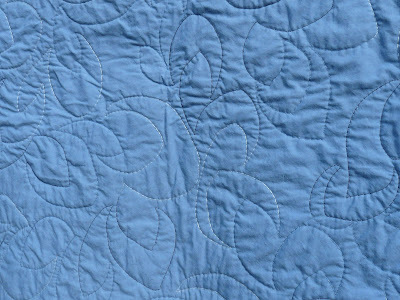 )...The average price on Etsy of a lap quilt ranges between about $125 to $170. I spent 5 hours piecing that top shown above and it is only a disappearing 9-patch design (ie., not too complicated). 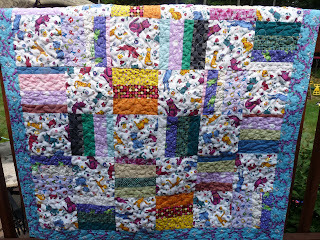 A quilt that size requires just under 4 yards for the top, about three for the back and another bit for the binding, probably $10 in batting and a little for thread. 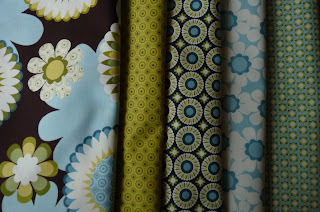 At the average price of $7-9 per yard for fabric, materials alone are close to $75! 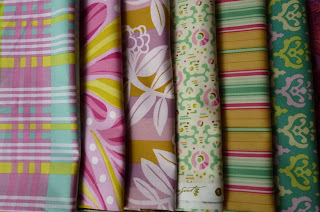 Now I can get name brand fabrics for $3-4 per yard at a couple of places, but they are not always predictable in their stock, and are often not this season's patterns. None the less, I can probably drop that price to about $55 with selective shopping. If I say that it would take me 4 hours to simply quilt and hand bind the lap quilt, and the 5 hours already spent, I might make a slave or peasant's pay of about $10 per hour on the quilt. Is this worth it?? or am I just plain nuts. With multiple degrees in mechanical engineering, why would I ever aspire to only make $10/hour?? Well, I don't. I hope to make some quilt tops, use these as a tool to gain experience on the new LA, and use this as the catalyst for a "life change" (AKA new career, new calling, etc). I still teach part-time at a college (again at the pay of a peasant) and plan to continue this even if the quilting gig pans out, but with my youngest child just 2 years from starting kindergarten, I want a home-based profession, which still allows me to eat, breath and absorb fabrics, and hopefully make enough $$ to stay afloat given the rising cost of materials! I have decided that I have made my quota of Project Linus quilts for the year. I have 51 ready to deliver in 3 weeks. I have another top which lacks only 1 pink & orange block (in the mail I think) to being complete, but I have run out of batting and don't know if I want to order another 40 yard bolt right now. Sigh...I have used 80 yards of batting since last November - Amazing! So, with my scraps of novelties dwindling, I am changing gears a little. 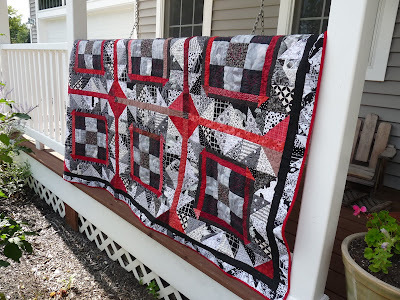 I am focusing on making up a few larger quilt tops, perhaps like the one shown above, that I can quilt when I get my long arm. That I hope will be in 1-2 months. I spent 2 hours quilting on one last weekend, and think I am ready. There are a few business issues to also sort out first. 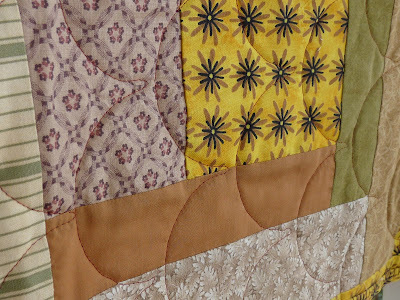 With all of that, does anyone have any thoughts on quilt designs, fabrics, etc that they like to see? 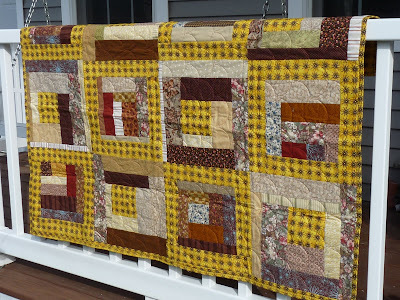 I often make quilts custom for each person, rather than making them up speculatively. So, I really want to make a few tops that will have wider appeal, rather than being sheltered by my personal tastes for particular colors and intricate piecings. I started this nearly 2 years ago as a Christmas gift for my husband's brother and wife. I also started another one at the same time, which I thought I liked better. The applique was not yet on this runner then. I put the question to him of "Which runner do you like best to send to your brother", and he chose the other one. I was kind of bummed, but didn't back down from his decision. I finished that one, and promptly packed this one away for 20 months! A few weeks ago, I found it and decided I was in the mood to do the applique. I am so completely thrilled with his making me keep it! I only realized after I thought it was finished that I forgot a couple of stems to the purple flowers!! Oops...I'm just pretending that they are "floating" flowers. 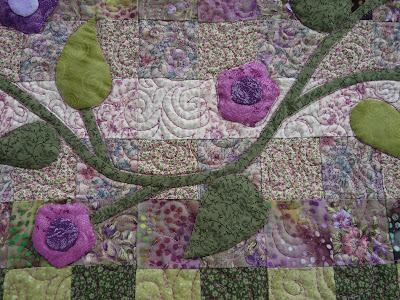 I quilted it in a variagated rose thread. I was a little bit tentative about doing this, versus a neutral tan, but I love the effect. ...probably need a double click to see detail in natural outdoor lighting. The dark purple is a Loni Rossi that I picked up for $3/yard last year. 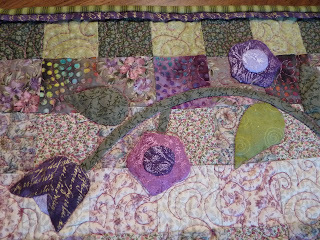 I used it on the flowers as well as a flanged border by the binding. And a glimpse at the back. The rose thread shows nicely against the green, and is most unexpected. Rather pretty texture I think too. On a different note...I am still ridding my stash of novelties. These are Project Linus quilts #47 and 48 (unless I lost count). 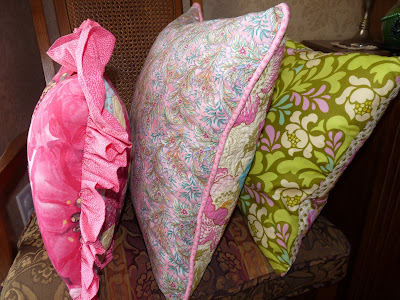 One of the quilted pillow covers got the pink ruffle (to make it look larger than the 12" pillow that it is). Another got a piped edge, which conveniently I did not have to actually make. I had made a pillow cover 3 years ago which used that pink piping so I just had to pick ot off of that cover. Not fun, but recycled. And the last pillow (the 16") is without any edge treatment. I just LOVE them. They are girly and fun and pretty. 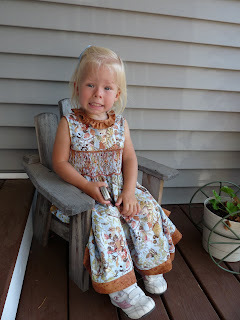 I used as many different coordinating fabrics just to add texture and variety. Here's a peek at the backs of them (which are not quilted). I did a slip opening with velcro closure on the back so that they can be removed and washed. And...one final peek at the 2 quilts that will eventually be in my Princess's room (later this year or in the winter sometime). 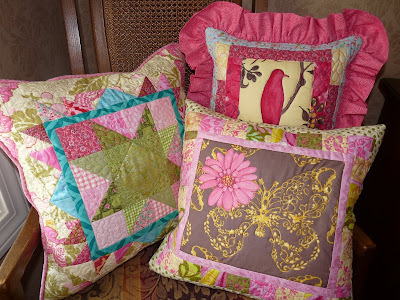 The new pillows are SO cute with both of her quilts. Not too shabby a digs for a little gal just turning three! 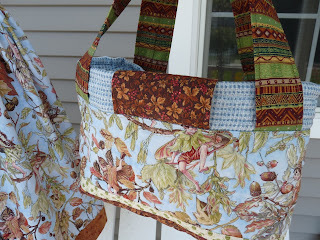 Long before I ever quilted anything, my mother taught me to sew. And to embroider and eventually to cross stitch and do needle point. I remember learning basic sewing in about the 1st or 2nd grade. It was not until I was 21 that I ever attempted my first quilt. This may be surprising since much of what I post here is quilt related. Eight years ago when I was expecting my first (a son) and my sister-in-law was expecting my neice, I taught myself to smock. I shirred the fabric by hand. It took hours just to do that. I had to select checked fabrics because of the natural marking, which made the shirring by hand possible. 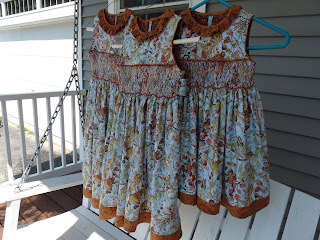 Now I can say that with 10 more dresses under my belt, I am quite proficient at making smocked dresses. 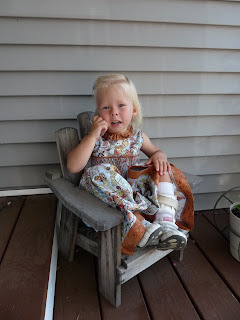 This is my daughter on the day of her 3rd birthday party. She's the ultimate "frilly dress" girl if there ever was one. 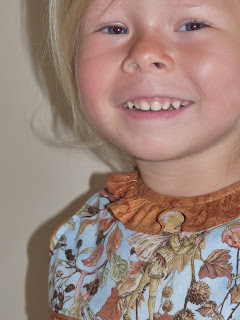 I made this dress from Michael Miller's petite Autumn Flower Fairies material. It's just gorgeous - much different than a picture can show, having a luscious gold veining throughout. I now have a friend of mine's smock pleater to do the shirring (it's on semi-permanent loan), so I am not limitted by striped or checked fabrics, which make the shirring much simpler if doing by hand. I can pleat the bodice in a matter of 20 minutes, not 6 hours! I stumbled into the "Coin" colored Fairy Frost too, which is a lovely complement for the fairy fabric since it shimmers too. As a surprise, I actually made three of these dresses. One is for Sophie, and the other two for her cousins, ages 5 and 7. They have birthdays this fall, and happened to be in the US for her birthday party (normally live in Italy). 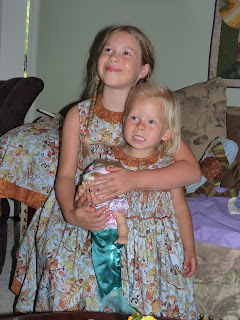 My oldest neice totally loves fairies so it was an instant hit. The other prefers animals so it may have missed the mark with her, but her mother likes it :-) Unfortunately I still have the dress because the nearly 8 year old is a tad larger than I was led to believe. I need to take the sleeve openings out a little. It's a much larger take out job than it is a "fix" job. Just so long as it fits her is all I care since I know she won't wear it otherwise. Rather than doing a traditional collar, which requires pressing, and often gets stained, I chose a simple ruffle. I love the way this turned out up by the girls's faces. The smocking is rather simple...just a waffle smocking all over in varying coordinating colors, and three bullion roses. It looked just right against the busyness of the fairy fabric. And another twist, no bow in the back! I am learning that the older girls don't like to lean against the pretty bows. My Sophie does not care, but the older girls do. So I chose a very simple elegant look with two buttons. There are no button holes - it is just stitched down. 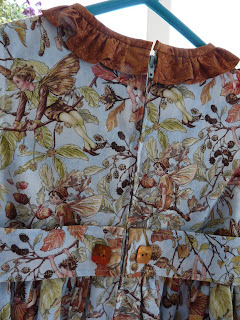 The buttons are bronze shell, and have a nice irridescence like the coin fairy frost. And as if a fancy dress wasn't enough, I also whipped up two little bags as well (with little coordinating change purses inside). My younger neice was not so anxious to try her's on (which did actually fiv exceptionally), but the older one did happily. She's the one that loves pretty dresses and fairies. An instant hit. Now it's time to think ahead to Christmas (sigh! ), and contemplate what I might do for the more animalistic of the two...Seems I owe her another outfit more to her personal liking. 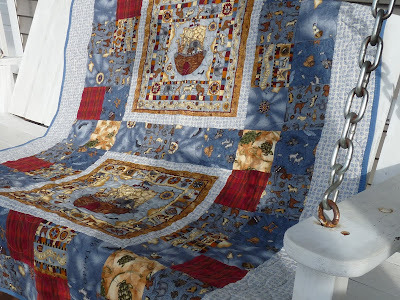 Most people that know me know that I make "Art" quilts, as opposed to "doll" quilts. Who would dedicate hours of creative mind and precious sewing time to making a blanket for a DOLL?? I make my mini's to either hang on a wall or to use as table pieces. Dolls, hummm, I really don't think so. Or so I thought. OK, so this is a first. My very soon to be 3-year old daughter has been on an orange kick. Every clothing store we shop in she pulls the orange pieces off of the racks. Same is true for when we are at the fabric shops (which is considerably more often than when we shop for clothes). While I was at the Maine Quilt Show a few weeks ago, I picked up some fun orange prints - some from Mendocino, and from Farmer's Market, and a few others. I thought Sophie'd get a kick out of them. She did, only she was not too keen on me cutting them up to make anything, so I did it rather discretely. We celebrated her 3rd birthday yesterday, and she got a bunch of homemade baby doll clothes from my mother, another baby blanket from her, and I made her this baby quilt (aka doll quilt). I had no idea my mother was at her machine too. 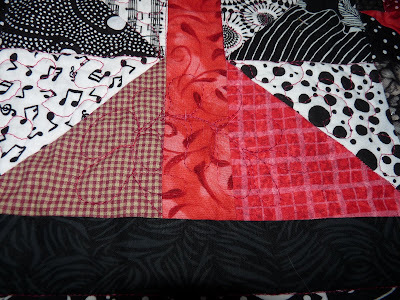 The curved piecing was liberating and fun. I had no pattern, just wanted the piece to have movement. The quilting took 3 hours surprisingly. I'm not sure I'll ever quilt a piece so much with my walking foot. 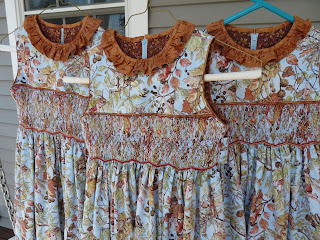 Mine does not feed perfectly all of the time, so there are places when the fabric was bias and wanted to pucker a tad. My green sashings show this more than anywhere else. Had it not been for a silly doll I might have panicked. It sort of reminds me of corduroy. It definitely carries that feeling of water movement. 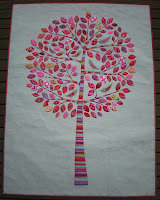 It's a quilting that I'd love to do with a long arm. I've tried it on my machine but have not been able to move the fabric evenly enough to keep spacings. Stay tuned...I'll show more sewing that was done for Sophie's birthday this week. 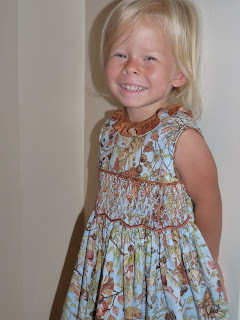 I was busy the last 5 days preparing for her party so my sewing machine was off collecting dust this week. Not for long; I am preparing a number of scrappy kid-friendly Project Linus quilts to complete prior to a September 19th event where I will bring all of the ones made this year (thus far it is 46). 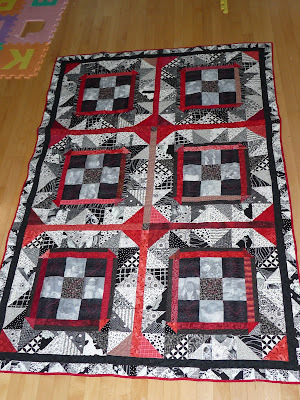 In hindsight, I'm not really sure what possessed me to think I wanted to make a black & white quilt. It's definitely not my colors, but now that it is all finished, I am pleased. 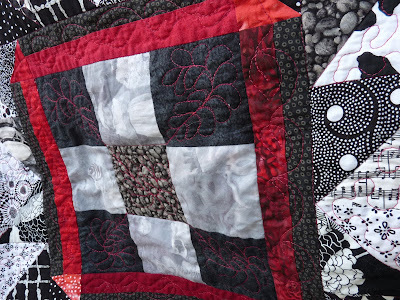 This quilt is part of the Black & White challenge. It sat for the longest time in three large pieces. Then I quilted one of them, and it sat another 3 months. About 3-4 weeks ago, I decided I'd rip out the quilting, sew all 3 together, and requilt it. 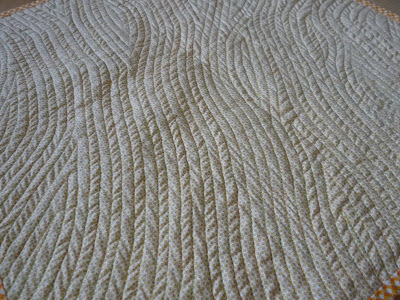 I mostly hated the backing I'd initially chosen, but the quilting had it's issues as well. 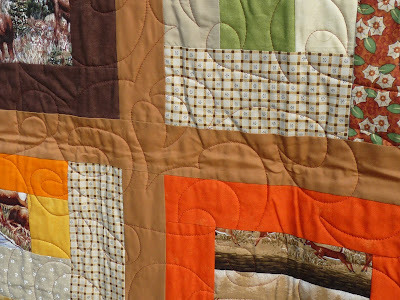 This quilt has 6 pannels that are like this. 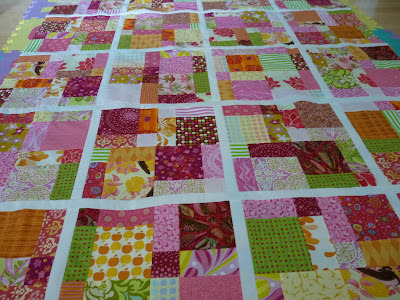 Here's another look at the blocks in progress, and a peek at the initial plan for the quilt. Each block has four photos printed on fabric of my kids. I know that these are not the best quality, and have since learned of another product that is better to use, but I was not changing anything once it was together. 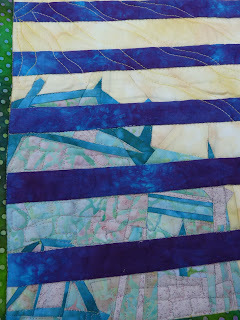 The quilting was moderately challenging for me because my machine has a TINY throat/neck and it's a real pain to cram it into it in order to quilt the center of the quilt (now we all understand just WHY I really want that long arm...). This quilt is on the order of 52" x 75". 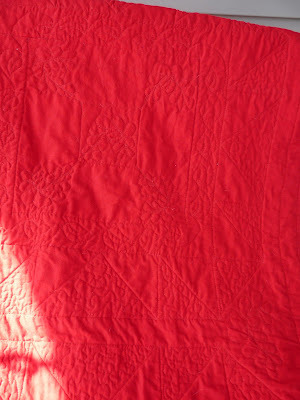 It is quilted mostly in red thread (despite the fabrics being largely white) because I wanted the quilting to blend on the backside, which is solid red. I didn't want to have any areas where poorer tension might show if I used a top thread that was white. I am pleased with the red thread decision. It actually looks pretty good. In the red areas, I free quilted feathers. They are far from perfect, but nice, and better than more stippling. What I really love is how I quilted the black 9-patches around the photos. I consternated over what to do for 2 weeks, and ended up doing more free feathers in the black squares, and nothing on the photos (which unless up close just appear soft gray). ...a peek of the back (which is likely not too visible without double clicking). It'll keep me warm this winter, and will remind me of my cutie kids forever. 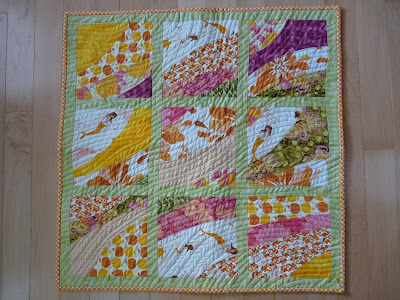 This month I started another block swap on Flickr - Quilt Block Exchange. 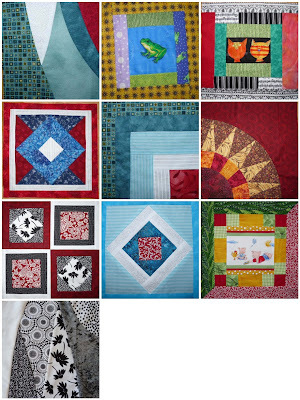 My primary goal is to acquire a variety of blocks with which to make Linus quilts. Here are all but one of the blocks I made this month. I specified that I'd like orange & pink blocks. I am drawn to this color duo right now. I have received 3 of my 10 blocks and will show them towards the month's end. The signups are monthly so if you think you may be interested, go have a look! 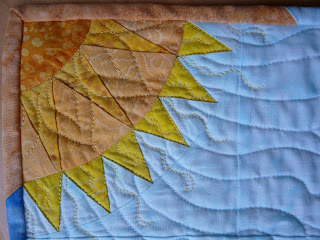 I have participated in a few sessions of the ALQS (aka Another Little Quilt Swap). This round was different in that more artistic quilts were done. Now some of them were too "granola" for my taste, having too much glued items, excessive texture, and unwashability, but that was the terms of the swap. Generally speaking, this swap attracts extremely tallented artisans, so I felt that the risk of receiving something I would not like was slim. Very true. 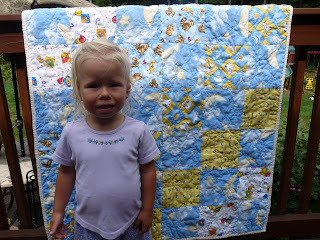 About 25 quilts were made and pictures were anonymously posted. Each swapper ranked their favorites. This was one of my top three choices. I have traveled to Italy several times. It's architecture, culture and scenery are amongst some of my favorites. Come to think of it, I like the food and the sense or romance quite a bit too (takes me back to a little "trist" I had with an Italian that I met on a Swiss Air flight a decade or so ago!... - I used to travel significantly for business then). 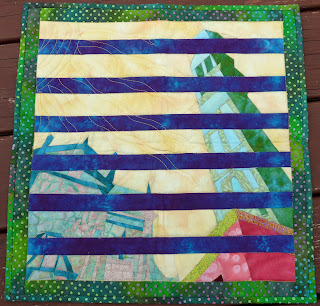 Dare I not digress too much though...I was lucky enough to receive Deana's "Italy through Window Shades" quilt. It is all from nice batiks, and so intriguingly constructed. It's so much me, and I feel fortunate. Thank you Deana - you did a wonderful job. 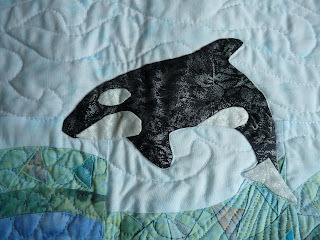 Now, as coincidence would have it, my "Orca" quilt went to whoelse but Deana! I regret that I never got a nicer picture of the quilt (June was SO rainy and I never got a sunny day to take it outside, before I plum forgot and mailed it off!). 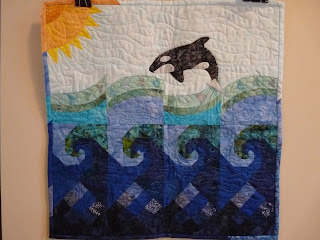 It is partially traditional piecing, partly paper pieced, and a needle-turn appliqued killer whale. 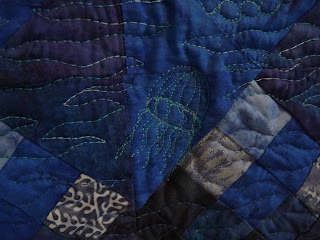 I live on the ocean, so themes with plenty of deep blue water occur often in my quilting. The sky had a wispy movement quilted in it.